When the thermostat on your water heater fails, and they all do eventually, it can go one of two ways. Either you get no hot water at all, or (as happened to me recently) on both gas and electric you get water that is dangerously near the boiling point because the water heater never turns off. The first case is annoying, especially if you need a shower, the second can not only burn you severely, it can cause leaks and other damage to your plumbing because the water is not only hot, but under more pressure than usual. When the water is too hot, you'll know because it will steam like crazy when you run hot water in the sink. In the shower, you normally need a small amount of cold water, even when the hot is on full. When the water heater overheats, you'll need to have the cold on full and the hot almost off. Of course if you have no hot water at all, you won't have any trouble knowing about it. There are other causes for not having any hot water, but the thermostat is the most common cause. If the water is too hot, it's always the thermostat that's to blame. The thermostat is cheap and easy to replace, and it will fail eventually, so it's almost always worth replacing it first. If it's not bad, you'll have a spare. You can pull the wires off and test the thermostat with a continuity tester if you're too cheap to buy the replacement kit. When the water is cold, there should be continuity between the contacts. When the water is hot, there shouldn't be. There are two thermostats on your Atwood water heater and they are very inexpensive and easy to replace. When you open the door to your water heater, you should see a rectangular, black section of insulation like the one in the photo below. Each thermostat has two wires attached to it. The one on the right in the picture above (T'Stat) is the actual thermostat that controls the heat of the water. 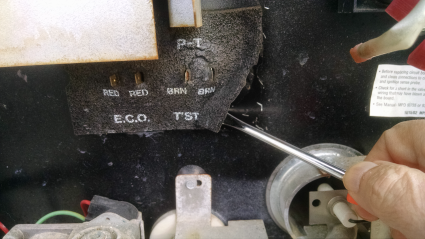 The one on the left, while technically also a thermostat, is called an E.C.O., which stands for Emergency Cut Off. The E.C.O. turns off the propane if the water gets too hot. It only works when you're heating with LP, so it has no effect at all when you're using electricity to heat the water. The kit below, along with a screwdriver or other thin piece of metal, is all you need to replace both the thermostat and the E.C.O.. The job is not at all difficult and should take you about 20 minutes. The only difficult part of the job is removing the two thermostats from the diabolical packaging. They are shrink-wrapped very tightly in plastic. Each thermostat has a clear plastic disk behind the contacts, so be careful not to cut that when removing the plastic. Take the old ones out first, so you can see what the disk looks like. Replacing the thermostat and E.C.O. (both are included in the kit) is not difficult. It takes about 20 minutes and it will save you an expensive service call (where you'll almost certainly be charged more than $12 for the parts). The first step in replacing the thermostats is to disconnect the ground strap from both the house and chassis batteries. You don't want any electricity at the contacts while you're working. If your rig has battery disconnects, you can turn them both off instead, but be sure to check with a circuit tester to make sure that there's no DC voltage in the water-heater compartment. There's no need to drain the tank, since the thermostats are on the outside of it. Next, note the position of the wires. The two E.C.O. wires are red and the two T'Stat wires are brown. The labels under them remind you of this. You might want to take a picture of the arrangement so you don't have to refer to the pictures here when you replace them. Now, it's time to remove the wires. Notice the clear plastic tube on the T'Stat wire. That's an extra emergency cutoff. If things get too hot in the compartment (i.e., it's engulfed in flames) the element inside it is supposed to melt and turn things off. I hope I never have to find out if it works. Leave it attached to the incoming wire from the control box — you only have to remove the wires attached to the T'Stat and E.C.O. 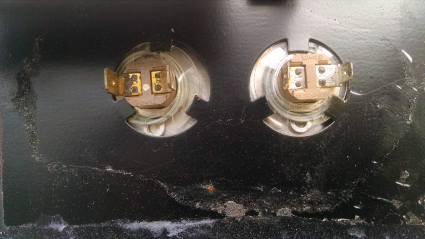 In order to remove the thermostats, you first have to take off the rectangular black insulation. It may peel right off, but more often it will break in pieces. Scrape of any leftover pieces with a flat-blade screwdriver, dull knife, or other implement (a putty knife works very well if you have one). 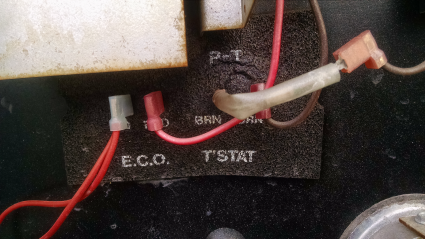 If you look closely at the two thermostats once you have the wires off, you'll notice that the T'Stat contacts are smaller than the ones on the E.C.O. This will help you tell which unit is which after you remove them from the packaging. The units also have temperatures stamped on the back, though they're so small they're difficult to read. The E.C.O. will have the higher temperature. The thermostats are held in place by the clear plastic disks in kind of a strange way. Look at the picture below where only the T'Stat has been removed. As you can see, there are three metal tabs extending in from the outside of the hold. Don't bend them. Even though it seems logical to do that, you don't need to. The plastic disk has two notches on the outside. The trick is to rotate the plastic disk until one of its notches lines up with a tab, then pry up the plastic disk slightly and rotate it so the disk is above the tab rather than below it. Keep rotating the disk until you've done this three times and the thermostat will pop right out. The plastic disk rotates independently from the thermostat. Rotating the thermostat itself may work to rotate the disk because there's some friction, but be careful — the thermostat is fairly fragile, especially if it's old. You can rotate the disk itself by putting a small screwdriver in one of the two notches in the disk (the one that's not near the tab your working on). The thermostat can be moved back and forth somewhat to expose the notches. Once you have one thermostat out, remove the other one. The second one will usually go much faster. You'll see the outside of the tank in the hole when they're out. If it's at all dirty, clean it up so the new thermostats will make good contact with it. This job is simply the reverse of the one above. Rotate the clear plastic disk until a notch lines up with a tab, press in on the disk, and continue rotating it with the disk behind the tab. Do this three times and the thermostat is in place. At that point, rotate the thermostat so that the contacts are in their original positions, side by side. This is important because the insulator sheet won't go on properly if they're in the wrong position. Make sure none of the notches in the disk are lined up with a tab and that the plastic disk is behind all three tabs. Rotate the plastic disk if necessary with a small screwdriver while holding the thermostat in place. This step is simple. Center the thermostats in their holes. Make sure the writing on the insulator is right-side up. Line up the slits with the thermostat contacts, and press it on, starting from the center and working out. It may not look as good as the factory job, but it doesn't really matter. Be sure the contacts are fully exposed. Put the wires back where they were. Important: If you drained the tank (you didn't need to), be sure to fill it up before reconnecting the electricity. 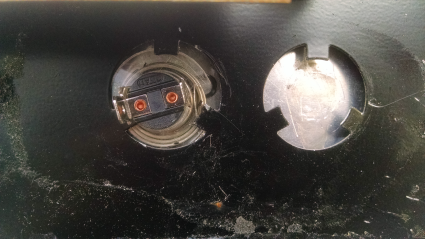 Pinch the insulator material around the contacts after replacing the wires to help keep out moisture. Reconnect the electricity, then cross your fingers and wait for the water to heat up. If it does, it's time to celebrate — you're a mechanical genius.